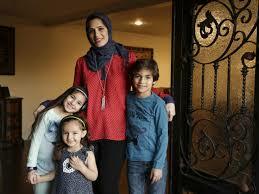 Mirvette Judeh began covering her hijab with a hoodie two weeks ago while in the car with her two young children. Someone might want to hurt their mother, she explained to them, because the head scarf easily identifies her as Muslim. “Now I have to have these conversations with my kids,” said Judeh, 39, who lives in southern California. As an anti-Muslim backlash swells across the United States following the December 2 massacre by a young Muslim couple inspired by Islamic State in San Bernardino, California, many young Muslim families say they fear for their safety and are struggling with their American and Muslim identities. She teaches her 8-year-old son, for example, to never utter the words “blow up” at school, regardless of the context, and to never pretend he is playing with guns, even if his friends do. Her son has asked if people hate him and his family, Judeh said, a question she can find difficult to answer after receiving hateful comments and threats because of her hijab. The problems have gathered pace since gunmen loyal to the Islamic State killed 130 people in Paris on November 13. But even before the Paris violence, anti-Muslim sentiment was on the rise, swept along by rhetoric from US presidential candidates – from Republican Ben Carson’s comment in September that Muslims were unfit for the presidency to billionaire Donald Trump’s recent call for a ban on Muslim immigration. Former Florida governor Jeb Bush, a Republican whose presidential campaign has struggled in recent months, has said the United States should only allow in Syrian refugees who can prove that they are Christian – a tiny fraction of the millions driven from the war-shattered country. Some Muslim families say they fear a rising tide of hate crimes directed against their faith, such as when a pig’s head was found outside the door of a Philadelphia mosque on December 7, an incident that made national headlines. Pork and pork byproducts are haram, or forbidden, in Islam. Some discrimination goes largely unnoticed, such as when a woman threw hot coffee at a group of Muslims praying in a park in California on December 6. The Council on American-Islamic Relations, which tracks such incidents, says the scale of vandalism, damage and intimidation at American mosques this year is the worst in the six years they have kept records. Many of the country’s 2.8 million Muslims say they fear such tensions could become uglier during a presidential race that is already tapping a vein of anger and bigotry. Jinan Al-Marayati, a 15-year-old Muslim who attends a Catholic school in Los Angeles, said she often feels pressured to defend her religion when the Islamic State comes up in class discussions.